I have a very particular way of making omelette including asparagus omelette. I learned how to make my omelettes this way in my first term living away from home at University. I lived in hall and had excellent food 6 days a week. On the 7th day our cook rested and we had to fend for ourselves. We had pretty limited kitchen facilities but one of our group of friends was particularly good at cheese and sweetcorn omelettes and I use his technique to this day. Hint : I always seem to need more eggs that I think but then what might start out as a light snack sometimes turns out to be very filling. This recipe is for an asparagus omelette to serve one hungry person. To prepare the asparagus snap the ends off each spear and rinse in cold water then chop into pieces about 2 to 3 cm in length. Fry in olive oil or butter for a minute or two no more then set aside. Prepare your other ingredients e.g chop bacon into pieces and fry until just getting crisp, chop mushrooms and fry for a few minutes, chop or grate cheese etc. You can use the same pan as you will use for the omelette mix so long as it is not too dirty before you start on the omelette itself. Pour the egg mixture into the pan and leave to stand for a minute or so. As the egg starts to become firm around the edges lift the corn just a touch with a spatula and tilt the pan so that some of the runny mixture runs underneath the cooked egg. Repeat this process all around the pan over and over until all of the runny mixture is used up. This will give you a lovely light fluffy texture to your omelette. You now have two options either making a folded omelette or finishing it under the grill. 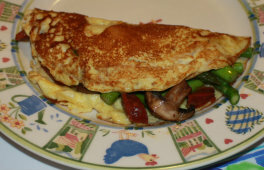 For a folded omelette the asparagus and your other ingredients across the top of half of your omelette and then fold the other half over before leaving for a few minutes to allow the centre of the egg mix to cook. For a grilled omelette spread the asparagus and other fillings across the whole of the omelette and pop under a preheated grill to allow the top of the egg mixture to cook. Both versions will taste just as good. I usually do a fold over method on a smaller omelette for 1 but if I am cooking a big asparagus omelette for the whole family I will use the grill method to finish off with. Asparagus omelette should be light and fluffy and not at all dry. Don't cook it for too long to keep it from drying out and use this method of lifting the edge to allow uncooked egg mix to run underneath. There are so many variations to omelettes I don't think I ever make two quite the same. You can use all sorts of different cheeses, bacon, ham, sausage, smoked salmon, cooked prawns, peppers, leeks, the list just goes on. You may or may not have heard of Frittata. This is quite simliar to omelette but is more about the asparagus than the egg. You might like to take a look at our recipe and find out how the two recipes differ. Fancy Trying One of Our Favourite Recipes?